Delta removed its award charts so that customers wouldn’t know what awards are ‘supposed to’ cost. That way they could continually devalue their award pricing without notice to members, and there’d be nothing to compare prices to. And they hoped customers wouldn’t have a reference point for what miles are worth, so members would be less resistant to silly pricing. Delta has created a company town, it prices what it wishes and assumes customers have nowhere to go. Indeed Delta profits because there’s little competition in more of their markets than other US airlines face. 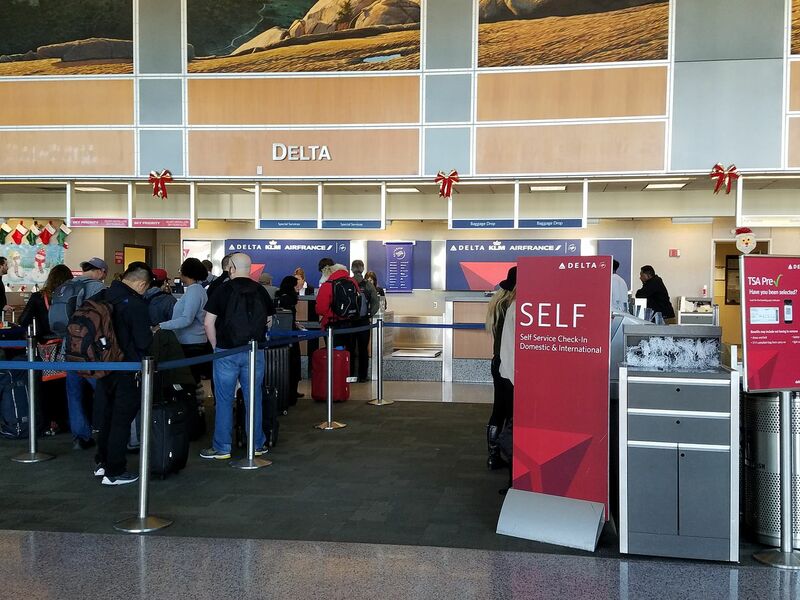 Delta has said they want SkyMiles members to spend their points for products and services sold by the airline instead of free travel. They’ve even speculated on ‘miles for haircuts’. While Delta keeps raising the price of award tickets every few months in a hyperinflation that would make Robert Mugabe jealous — last year raised price of several international awards for travel October 1 onward, but decided one devaluation in the first quarter of 2016 would be enough but it wasn’t they made no notice changes to Tel Aviv awards in March then later in the year they increased the price of transatlantic business class — at least they had stable prices, they just didn’t publish the prices. This Spring they obliterated the pricing of partner awards but again they just created a new partner award chart. However Delta has found a new way to price dynamically, hidden award chart be damned. Already they’ve practiced journey control. You might find saver award space on multiple flights, but they won’t allow you to combine those flights into a saver award. Two connecting flights on an otherwise legal routing might price out as more miles. Now though non-stop saver awards may price out more expensively depending on route. First class domestic saver awards have cost 25,000 miles one way under the hidden award chart. If a flight is available non-stop in ‘R’ inventory it costs 25,000 miles. Here’s January 10, 2018 Los Angeles – Atlanta. There’s a flight with R inventory which is a saver first class award. This same flight shows up as a saver award for Air France KLM Flying Blue, so it’s verifiably partner award inventory. However because it’s non-stop Los Angeles – Atlanta, hub-to-hub, it’s no longer 25,000 miles. Instead it’s 30,000 miles. In fact the lowest price for Los Angeles – Atlanta ever gets now is 30,000 miles. However domestic first class, even domestic first class cross country, isn’t 30,000 miles across the board. You can still book ‘R’ saver first class at 25,000 miles. In fact, you can book Los Angeles – Atlanta flights for 25,000 miles as long as your itinerary doesn’t originate in Los Angeles. Here’s Oakland – Los Angeles – Atlanta in first class (R) for 25,000 miles. This is the opposite of traditional journey control, where only some flights are available at the saver level on a connecting basis. The non-stop is never available at 25,000 miles. But some of those non-stop flights are as long as they’re part of a larger connecting itinerary! Delta has made it clear for the last several years that their currency has no stable dependable value, and they’re not to be trusted. Small children whose fathers are hunched over controls have landed planes with fewer signals than SkyMiles has given out. So much for the silly claim by Delta’s CFO that they’ve made SkyMiles more valuable since awarding miles based on the price of a ticket instead of distance flown. The only way I can understand Delta’s award price increases month after month is to think that Sandeep Dube is a student of history, and he’s been spending his time on Post-World War II Hungary. Nothing new here, common DL market pricing. DL has finally pushed me to start sleeping around with other carriers. I was a complete DL wh0re for years as a Diamond Medallion and 1 million miler. Because of all the SkyMiles devaluations, 2017 was finally the year I started flying other airlines. I took my first flight on Alaska. I flew United for the first time in 10+ years. I’ve flown more on American than the past five years combined. Hell, I’ve even sucked it up and suffered through Southwest if it was a nonstop. My 2017 totals on DL will be about half what they used to be because I’m now sleeping around. You took it too far DL and lost one of your most loyal customers as a result. I actually want to thank Delta. In the past I tried to maximize collection of Delta Skymiles (new Delta Skypeseos). I was continually frustrated by the inability to use the Skypesos when I actually wanted to use them. I was a bit sullen and angry each time. This is not good for anyone’s health. Then I realized the lack of useable value of Skypesos to me and my immediate and extended family. Luckily, we live near a major airport where I have airline choice. We switched to other competing carriers whose frequent flyer programs have proven to be much more friendly to the flyer. My family,friends and I now have very low balances at Delta, don’t care if we ever earn any Skypesos and don’t care that we cannot use our low balances. Having shifted away from Delta My pre-travel booking life is now much more enjoyable. So, thank you Delta! So people *DO* use KVS tool. With all of the references to ExpertFlyer and awardnexus by the bloggers, I almost thought there was a reason no one mentioned KVS tool. It’s great software I can run many copies of simultaneously to speed up my searches, and I’ve long preferred it over the web-based alternatives. Looks like while the bloggers tout ExpertFlyer, they still use KVS Tool to do the heavy lifting. It just never ends with you, does iit Gary? With *me*? I’m not the one doing this, I’m just reporting it. @Gareth Richards – partner award pricing isn’t tied to ticket price, the partner offers a saver seat or doesn’t and then Delta prices based on (1) whether it’s a partner instead of Delta, and (2) in Virgin Atlantic’s case whether it’s a close-in booking. Gary DL tells you at the point of sale how many miles are required, why do they need an award chart? Haven’t those been gone for years now? You seem to live in the past with your head buried in the sand. I know you feel like you are an astute and savvy individual because you read the transcripts on Seeking Alpha of publicly available quarterly earnings calls, but if you’d pay attention you’d know DL is transitioning skymiles to a currency and the award level should be commensurate to the market fare. You don’t like this and come on here with click bait titles and then still try to get hits and people to apply for the Amex card for your affiliate compensation. It irritates you to no end that DL wants to reward people in a manner commensurate to the value they bring to the table. Once a provincial, regional airline, always a provincial regional airline. I don’t usually leave a comment here and I don’t agree with everything Gary does (like you mentioned click bait titles and credit card affiliations), but… “DL wants to reward people in a manner commensurate to the value they bring to the table”… Really??? It might be an argument on the earning side when flying Delta, but in regards to this particular devaluation on the redemption side, you are not making any sense. Yes, Noticed that SFO-ATL coach has started pricing at 15000 instead of 12500.. Glad I burned most of my family’s skypesos last year. @Larry – they HAVE an award chart. they just hide it. pricing is based on the chart, it’s become bigger and more complicated. They still (1) manage inventory buckets, in this case we’re talking about the R bucket. And on the LAX-ATL route R is priced at higher than it used to be. this has no relation the market fare. I noticed some oddities last week when searching flights in the West. Economy LAX-SEA used to be 5,000 SkyPesos. All of a sudden it is 6,000 (not that it’s really a great deal either way). I think a bunch of stuff got an “adjustment”. Ironically, I just cancelled my Delta AMEX card today; a $95 annual fee to earn something that can be 4 times worthless (or more!) than even the cheapest rebates card. 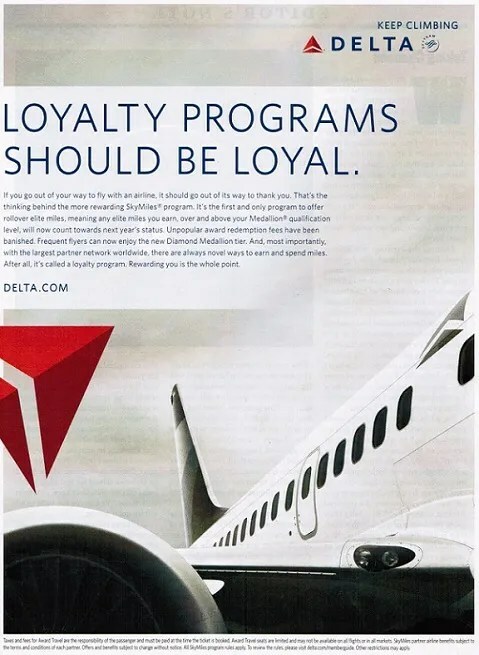 Sure, I stopped collecting Delta miles and stopped flying Delta years ago (all my West coast biz travel now goes through Alaska) but I always thought in the back of my mind “…maybe they’ll realize their error and reverse course”. Nope. Don’t get me wrong, I’m not delusional enough to think that a United or an American won’t soon be on-par with Delta…but if it means only a few dollars difference to go with an airline that actually rewards me with value (instead of a haircut, literally and figuratively), I’m not choosing Delta. @ Gary — Thanks for the HT! I am just so glad that Washington DC has little Delta presence. Poor Atlanta. Worst thing that can happen to any city is be a captive Delta hub. Only time I fly them is to the North Central US Region where no other airline fly. Can someone explain to me why Delta, KLM, and Air France STILL have immunity from anti-trust, price fixing practices. I know they got this when they were on the verge of going out of business, but they are now quite healthy, and this is anti-consumer, and without their waiver would be illegal. Why do they still have this protection???? Was just recently thinking of switching to KLM Flying Blue, at least I can lock in SkyTeam Elite Plus at 10 years with a much lower annual target (70k vs 125k MQM). The biggest negative was much lower award mileage earning, but at this rate, what difference does it make? Not trying to be snarky…I don’t care about a typo or run-on sentence here and there, but this post is nearly unreadable at some points. Your writing genuinely distracts from the points you’re trying to make. Maybe you need an editor? They want to think like revenue tickets connecting through the hub should be priced lower than hub-O&D. I see this as the beginning of hidden city ticketing on award tickets.